The rodeo is in town, so I will be accompanying T and baby C to the carnival and petting zoo today, followed by a BBQ cookoff and some music. And there will be drinking involved, just not beer. I prefer things a little stronger, ya know? What are you planning? Not everyone “celebrates” St. Patty’s Day, but it is Saturday, and that is something to celebrate every week! If you’re planning on indulging on any alcholic beverages, make sure you fill your tummy first…and these Buffalo Chicken Sandwiches fit the bill for good, carby deliciousness. Quick to fix before heading out for drinking fun! Or, for the more responsible, it’s still a great Saturday lunch to fill you up and make you happy. Try it today! Cook chicken in a skillet over medium high heat (about 2-3 minutes per side) until cooked through. Remove and place in a mixing bowl. Shred with two forks, or in in mixer. In another medium mixing bowl combine all of the ingredients through pickle relish. Adjust hot sauce and/or ranch dressing to reach your desired heat/creaminess, then mix chicken in. 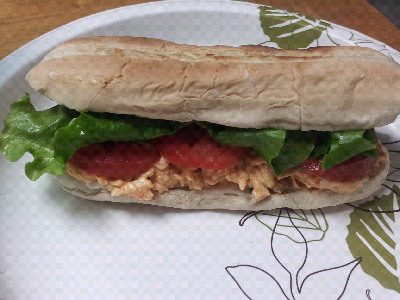 Toast sandwich rolls, spoon chicken salad onto bottom roll and top with tomato and lettuce. Voila! Magnificent sandwich…enjoy!